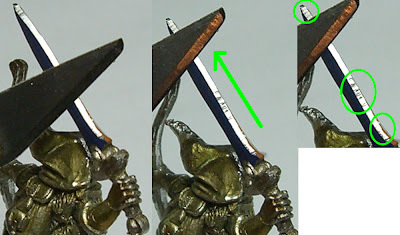 Most of our armies have models with blades of one type or another. Fantasy, for sure, but sci-fi as well. Sometimes blades come, not sharp, but at least they have an edge. Other times, like on the model pictured to the side, (and painted so it'll stand out better) weapons come really dull. Sometimes, dull weapons are just fine - huge great swords, power weapons, vehicle bits, etc... but we all know that sharper looks better. 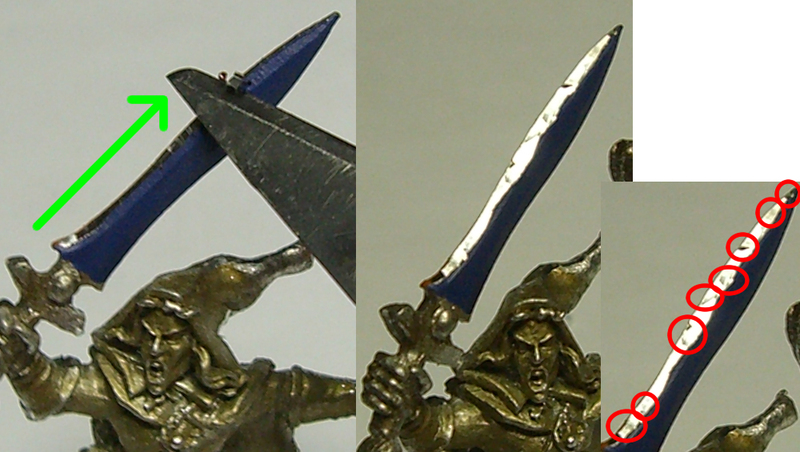 The following are two different methods to fake sharpen your fake weapons. Neither is the wrong method, they just end up creating a different look. One of the methods is to cut your knife forward along each side of your fake blade. This method will look a little more rough and therefor the blade will appear aged. Click the photo to see a larger example of this. This appears rougher because the blade catches and skips as it cuts forward. Careful not to cut yourself as it catches and remember to cut away from yourself. The other way is to scrape your knife backwards along the weapon a couple times. As you can see here, it's much cleaner. There's only a few rough patches, and even then they're pretty smooth. 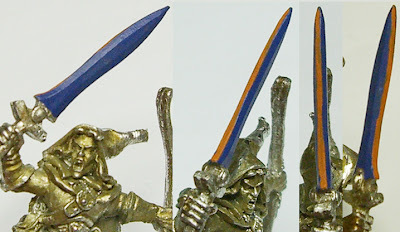 The difference is that this way, the knife blade doesn't catch on the model, and therefor doesn't skip and create a rough finish. You can read some more on scraping and cutting in my article on Cleaning Mold Lines. A file can always do a good job of adding an edge to a blade. Just having a few different shaped files will do the job.